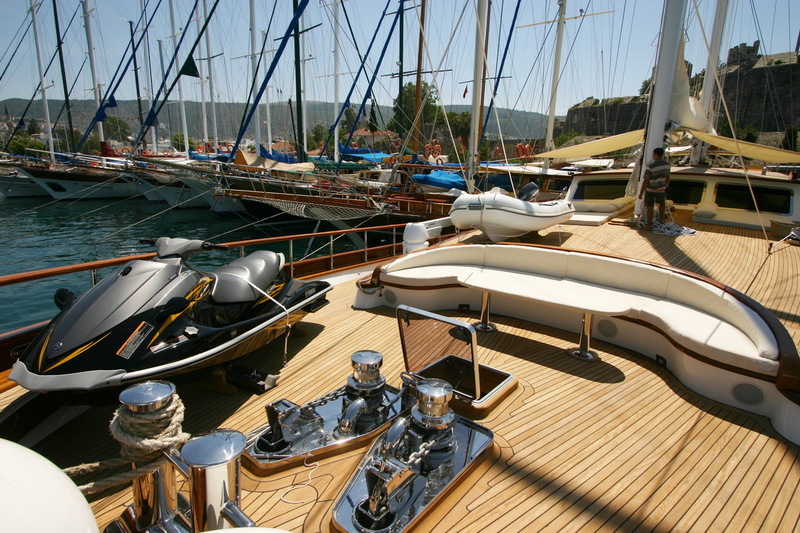 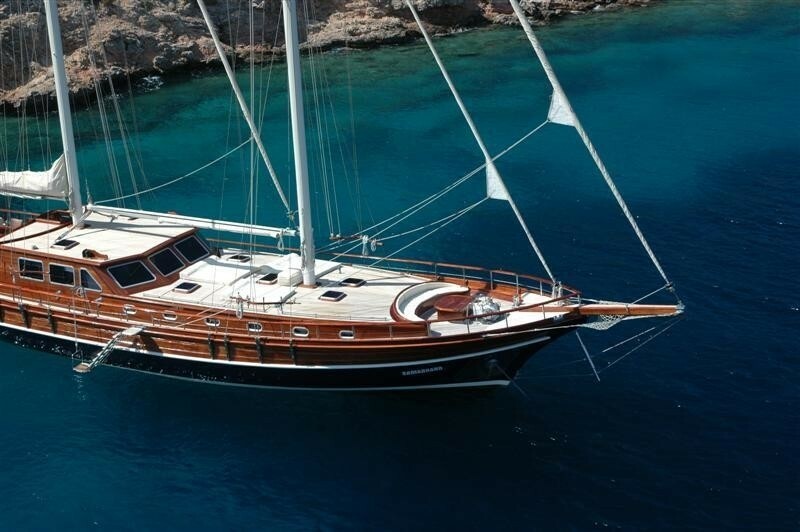 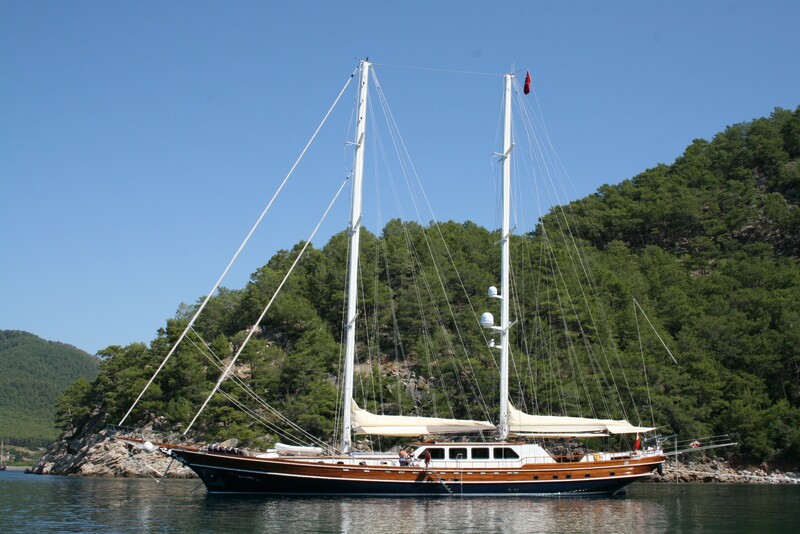 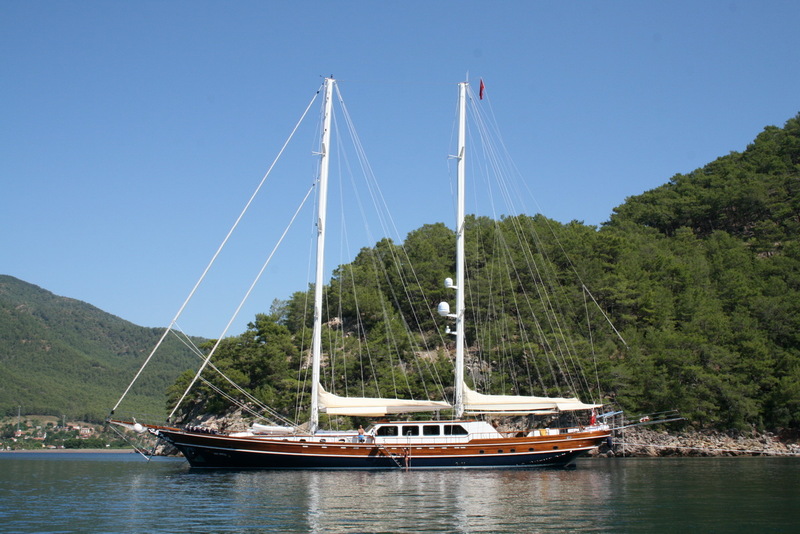 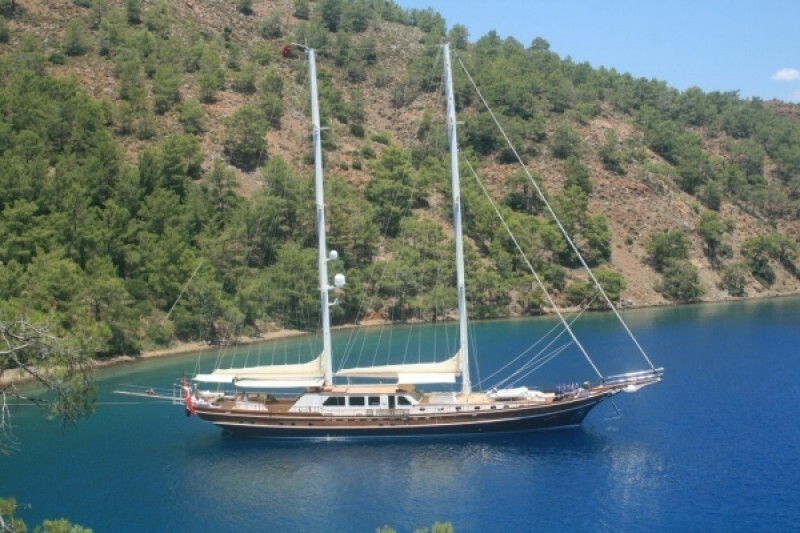 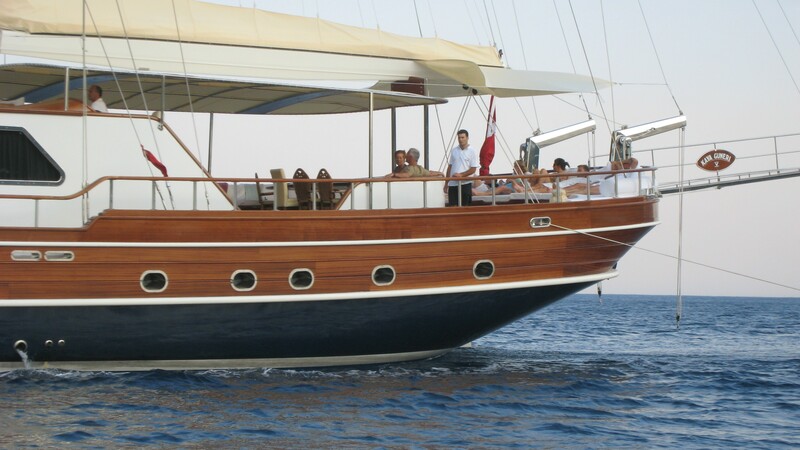 Luxury Turkish Gulet KAYA GUNERI V is a 39,5m (130ft) majestic charter yacht that was launched in 2009. 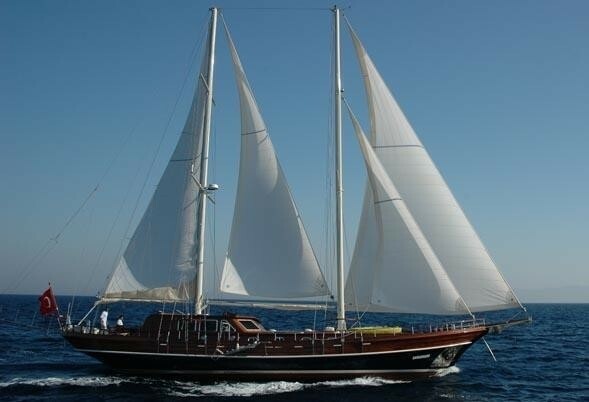 She is cutter rigged ketch with an impressive 700 square meters of Dacron sails. 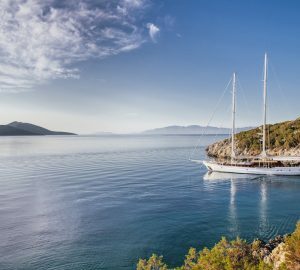 S/Y KAYA GUNERI V can accommodate up to 12 guests in 6 stylish and spacious cabins and is available for charter in the East Mediterranean. 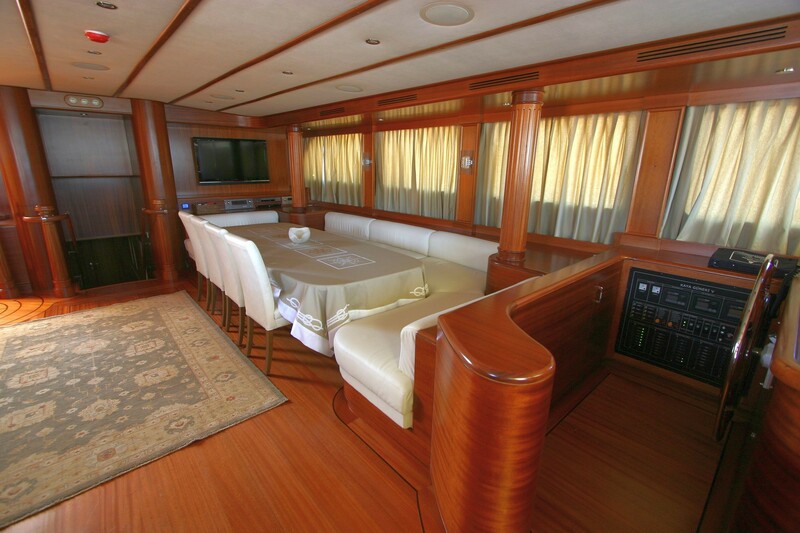 Sailing yacht KAYA GUNERI V offers generous interior living spaces with fine wood floors and panels and a simple yet elegant neutral décor. 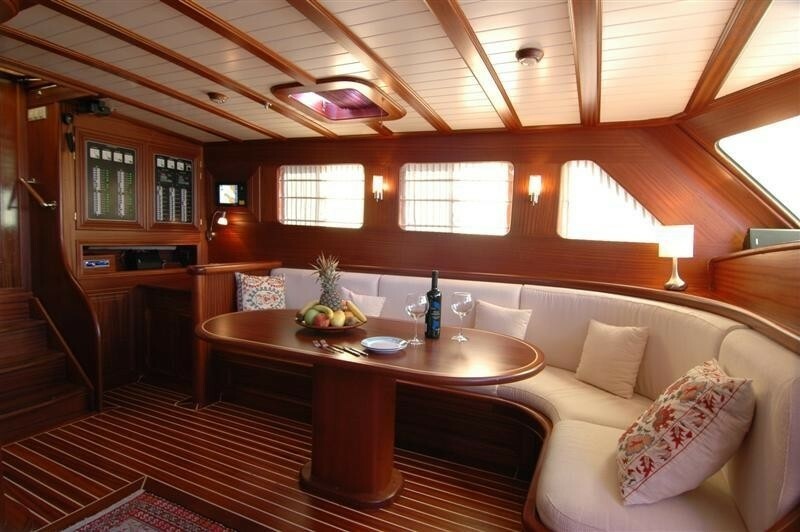 The main salon is large with wide windows allowing ample natural light. 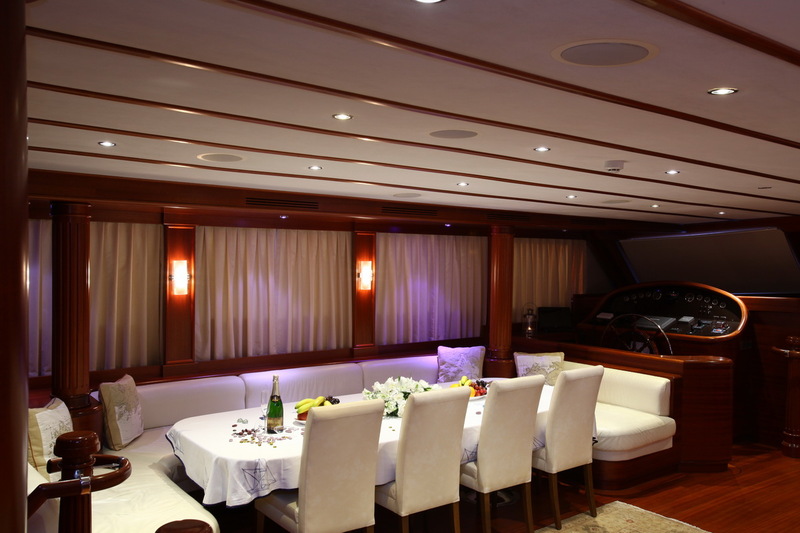 A formal dining space and salon share the space and is the idea area to relax and entertain in the comforts of air conditioning. 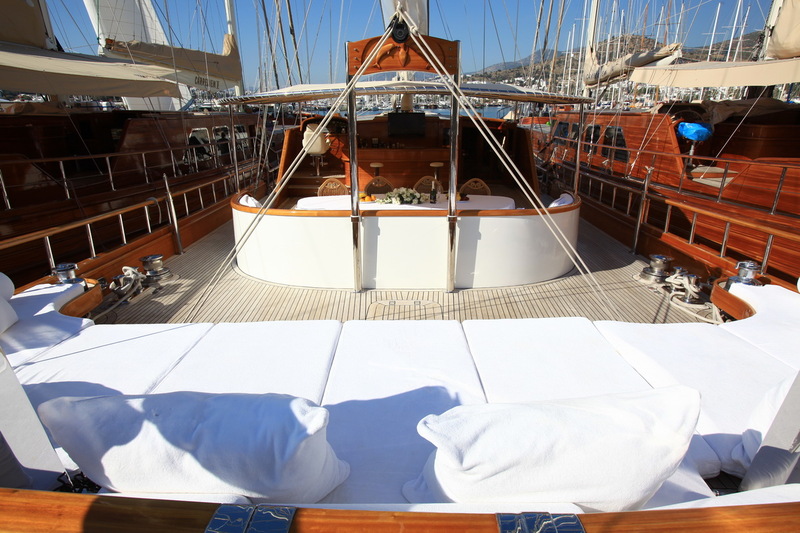 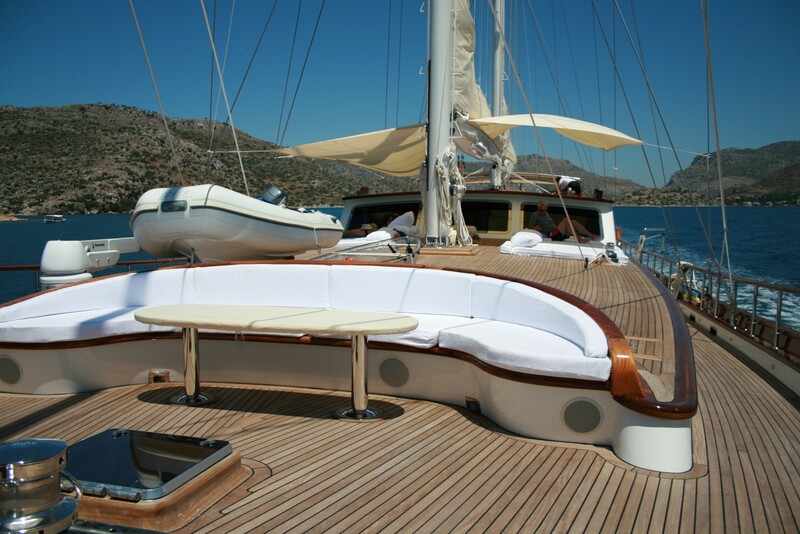 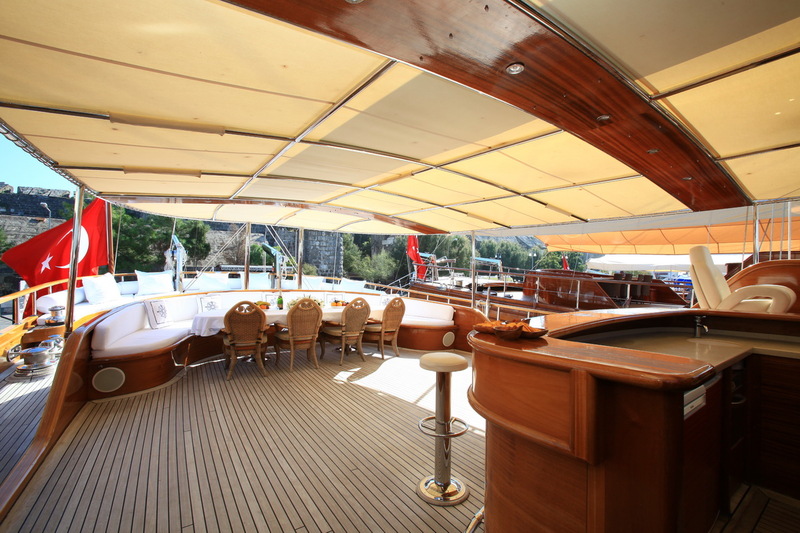 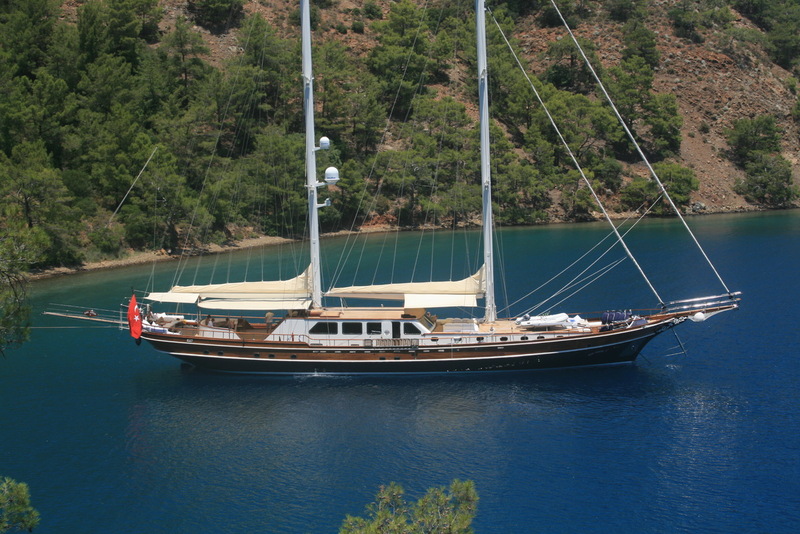 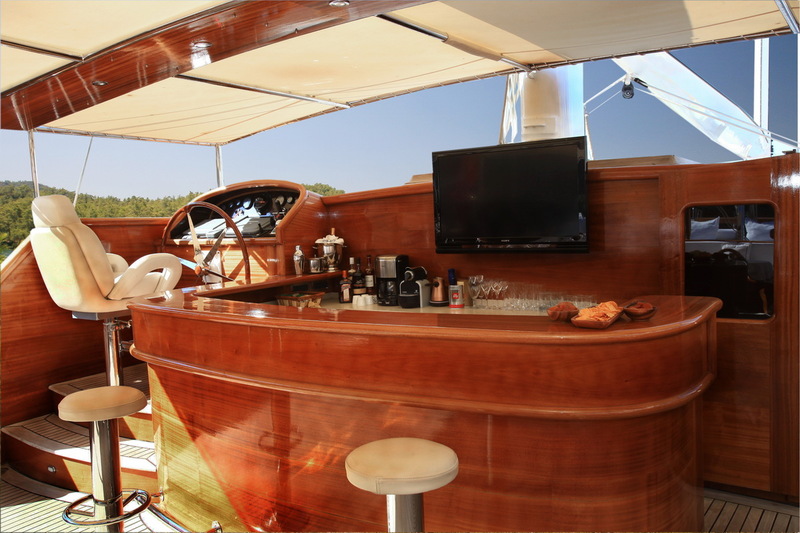 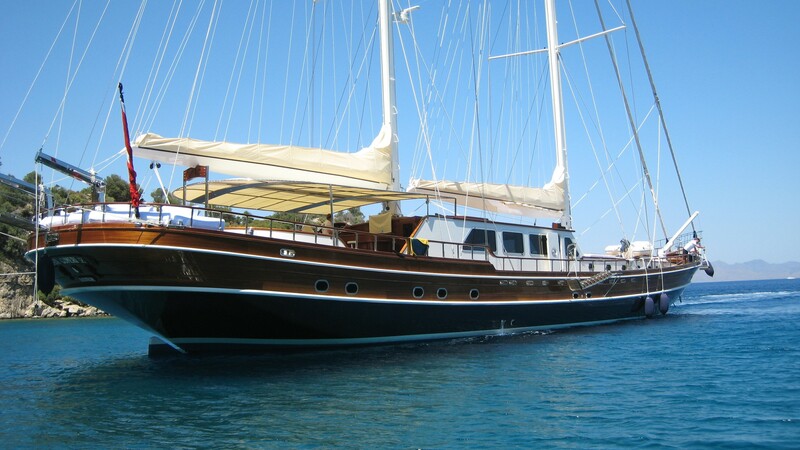 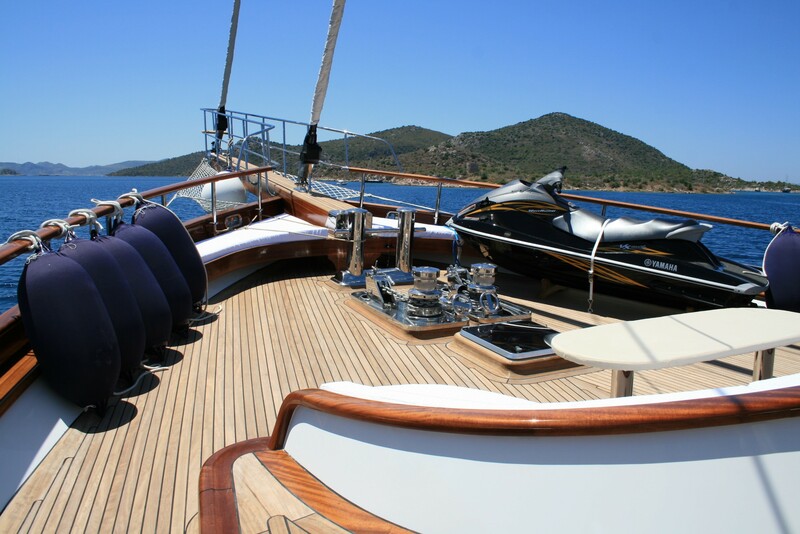 S/Y KAYA GUNERI V offers fabulous exterior living space to enjoy the warm sun and azure blue waters. 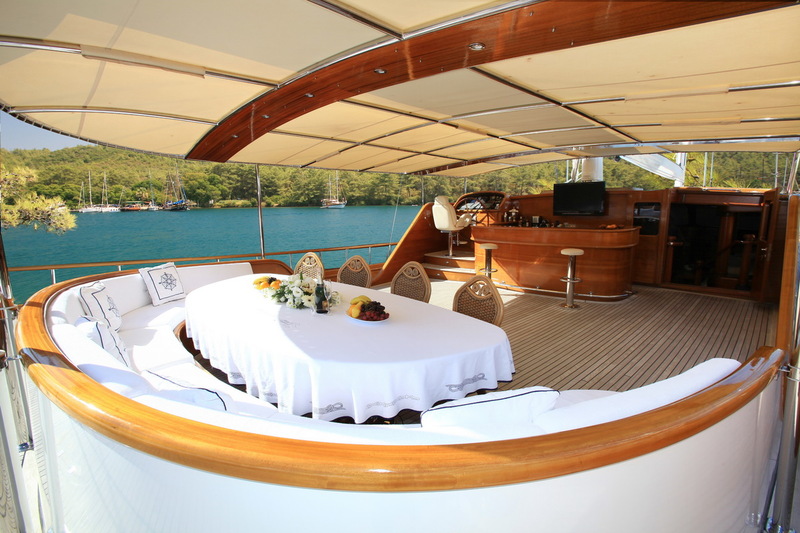 The aft deck boasts a fitted canvas Bimini cover and alfresco dining option, further aft a full beam sun pad is a traditional Gulet design. 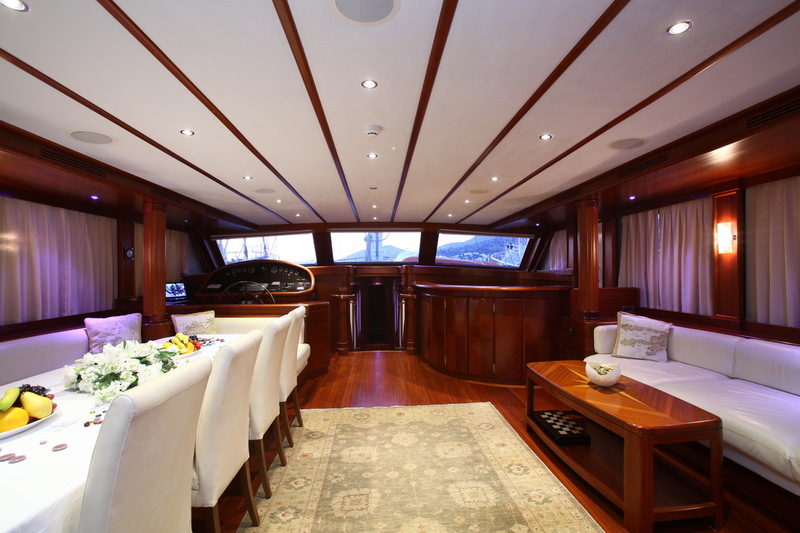 KAYA GUNERI V has a beam of 9m (30ft) making her a stable and sea worthy yacht, side decks are wide giving easy access to the forward sunpads atop the cabin house. 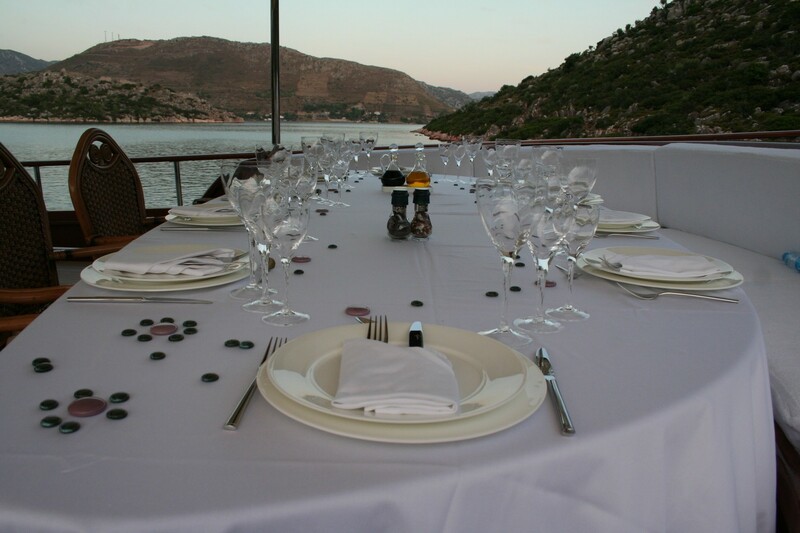 Further forward guests may enjoy an aperitif or romantic escape at the custom built smaller alfresco table. 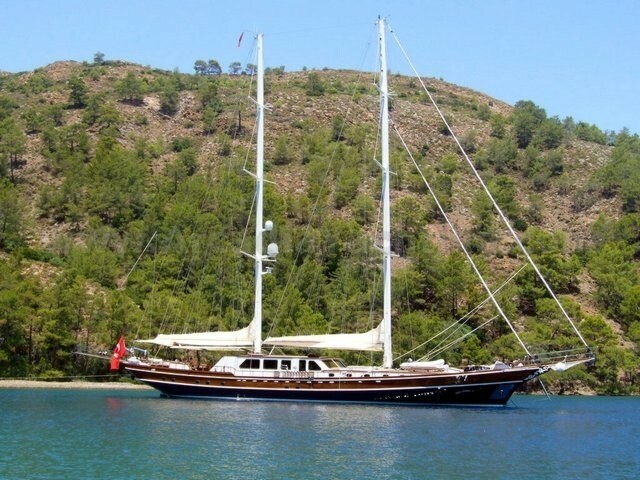 Sailing Gulet KAYA GUNERI V has a draft of 3.9m (12.5ft), she is powered by 2 x CAT 550HP engines when not sailing which are capable of up to 12 knots. 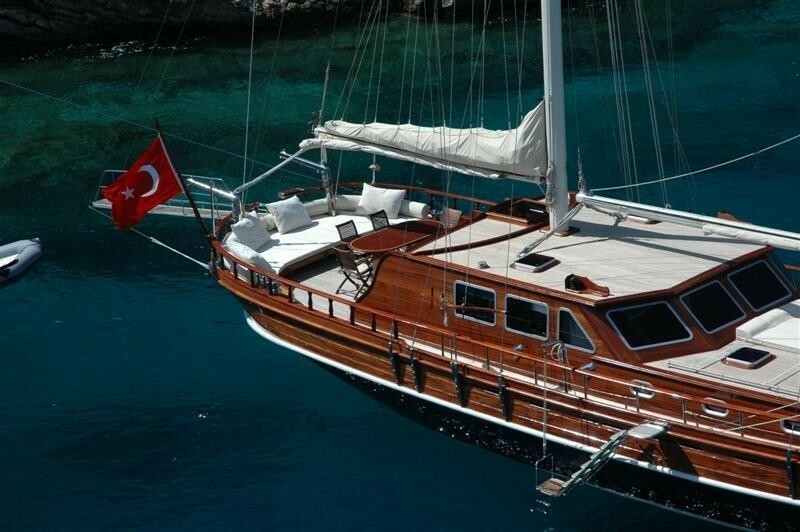 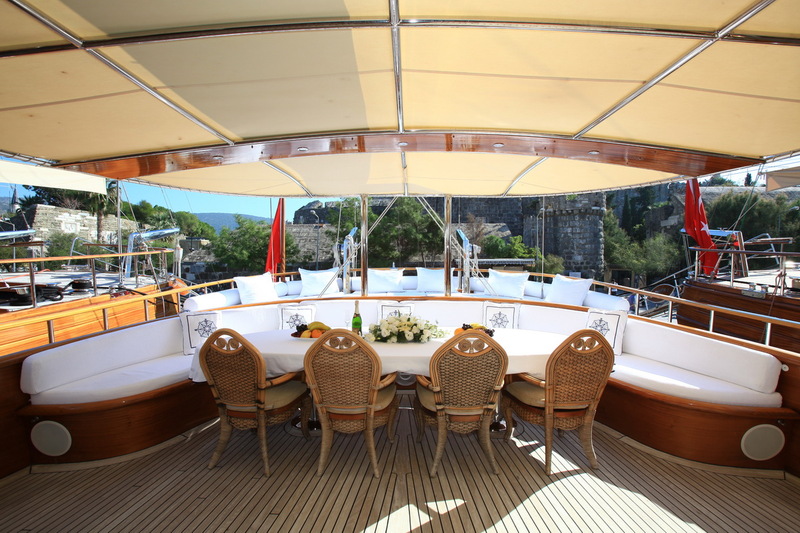 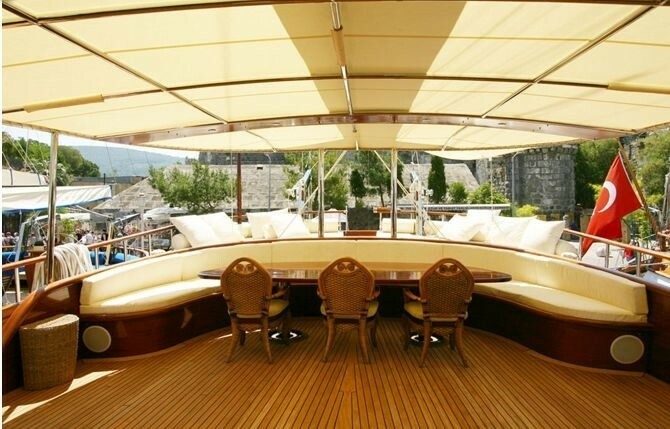 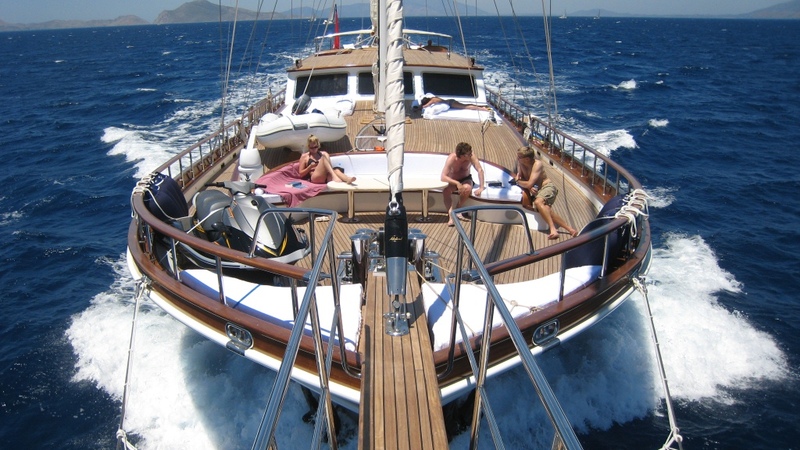 Sailing Gulet KAYA GUNERI V offers 6 deluxe cabins for up to 12 guests. 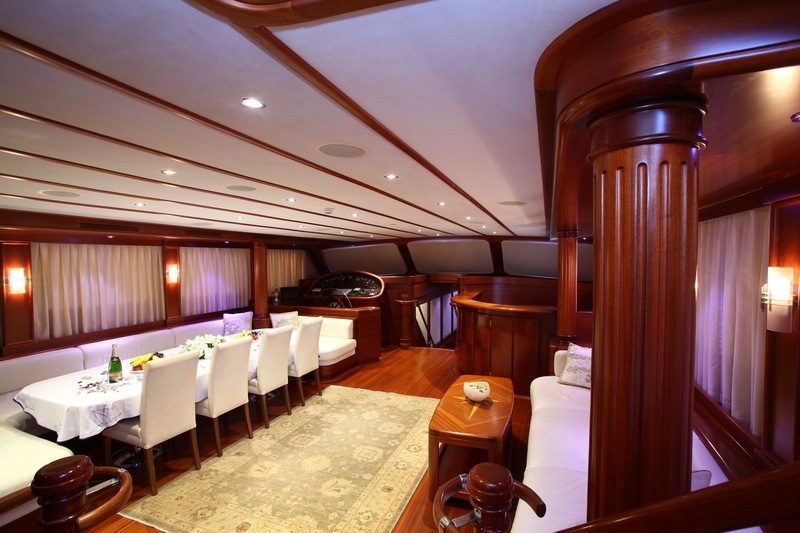 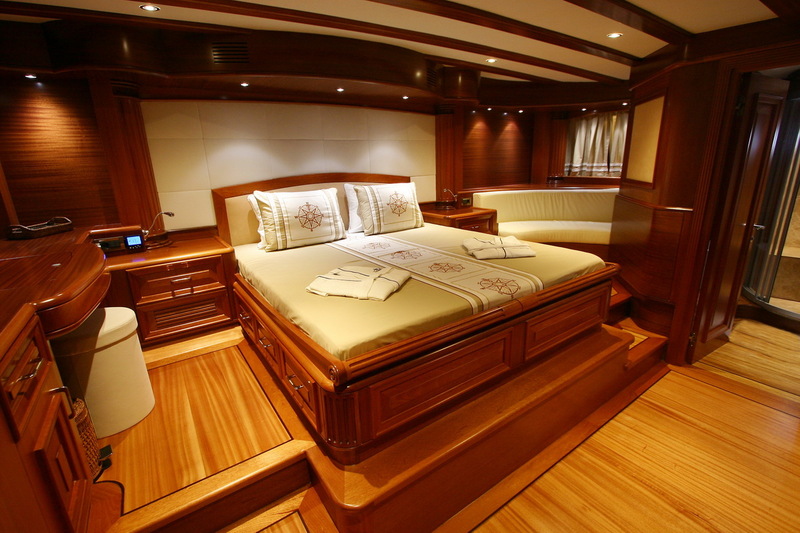 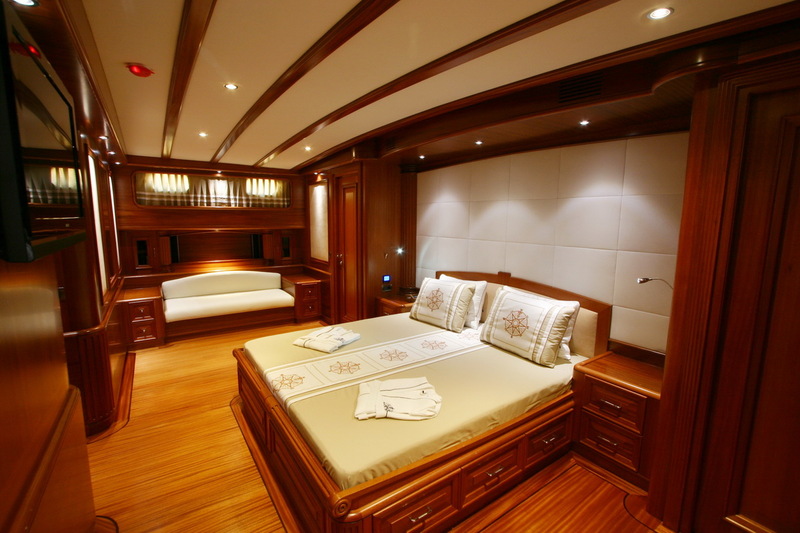 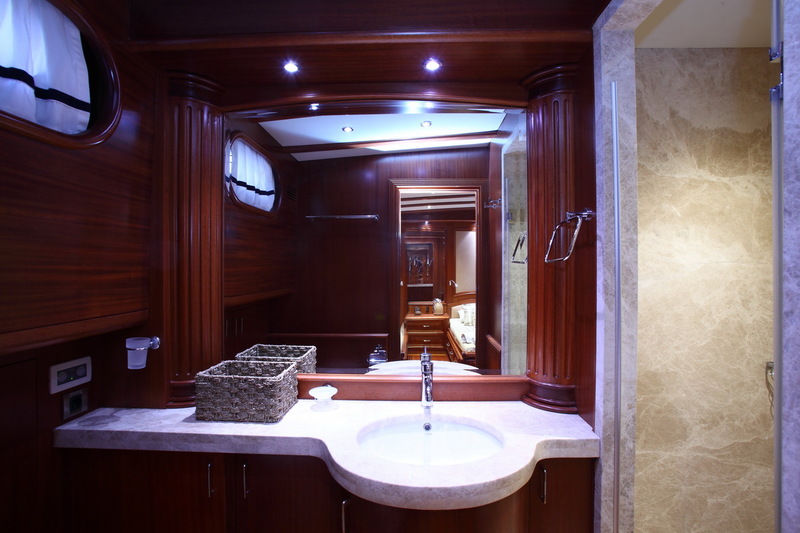 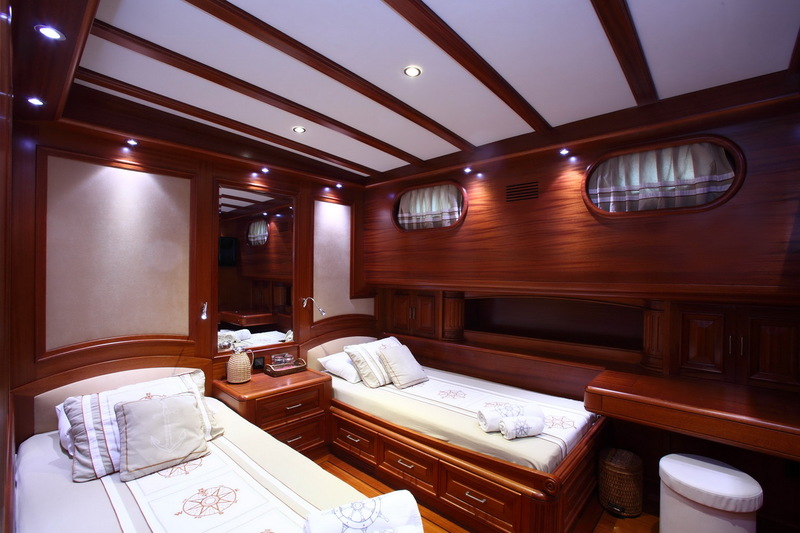 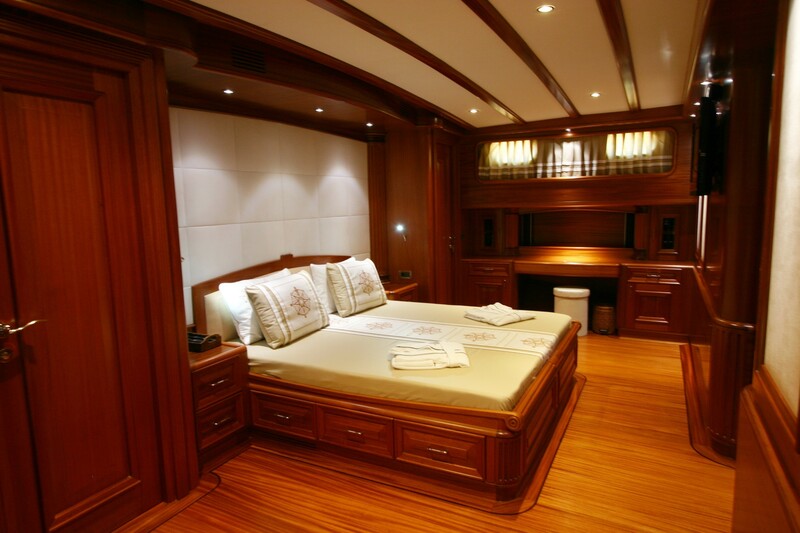 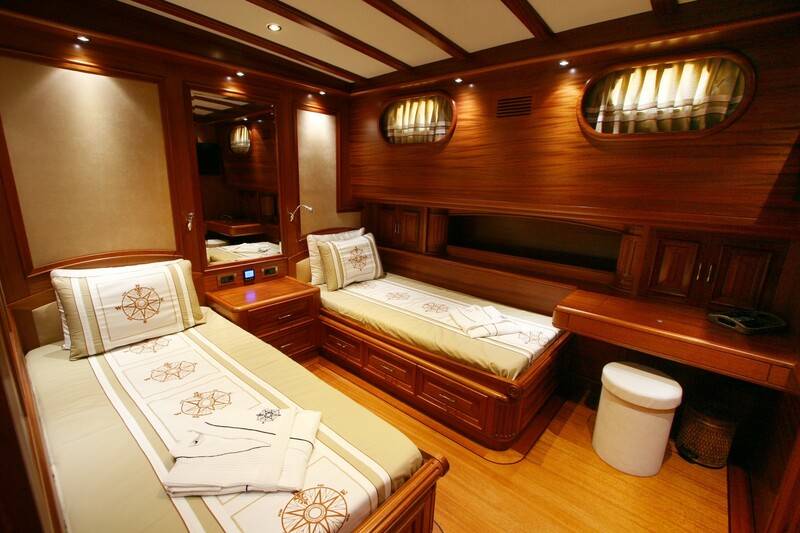 There are 2 master cabins, 2 double and 2 twin cabins, each with private dressing room, sofa and vanity table. 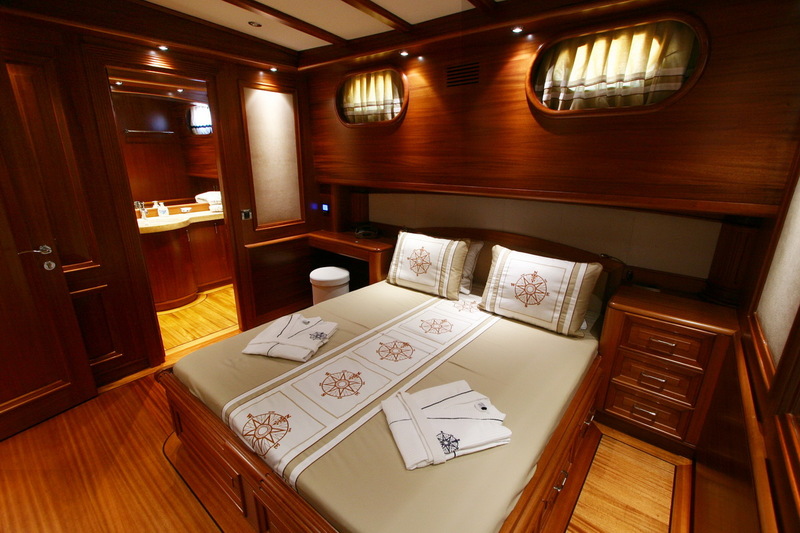 All cabins are air-conditioned and offer Satellite TV, DVD players, Stereo systems and Mini bars. 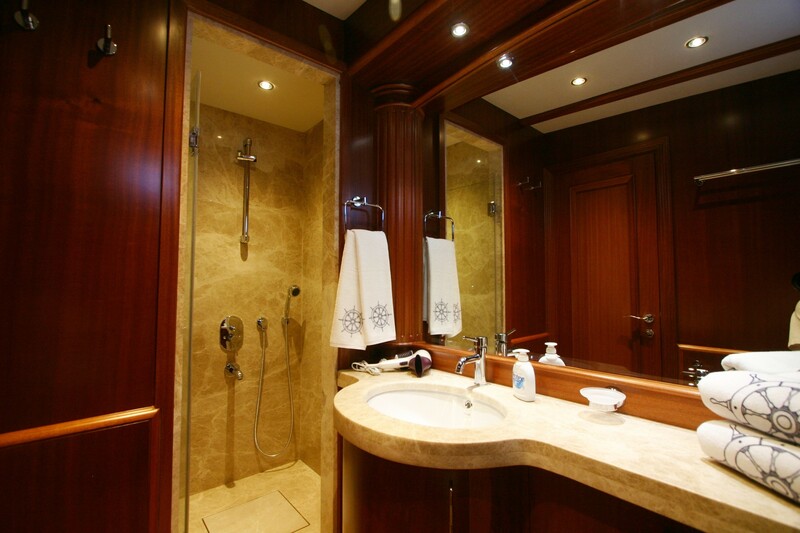 Each cabin offers en suite facilities with toilet, bidet and solid marble shower stall.